90 million seniors in Europe require care and safety without help of personal attendants that are just too expensive for most Europeans. Senior citizens living away from their children and caretakers are exposed to greater health risks when something untoward happens like a fall that goes unnoticed for too long. Find out how Digital Way Ventures uses IoT and blockchain to address the issues, join www.t.me/digital_way to know more about the project and how to participate. Digital Way Ventures recognizes this problem and harnesses the power of IoT and blockchain to create a solution in the form of a smartwatch designed around an elderly user. By offering this solution to the millions of elderly in Europe and beyond, DWV is going to create a brand new market space for affordable elderly monitoring is projected to be worth USD 25 million by 2022. The FavorWatch looks like a over-sized smartwatch with big lettering displays and buttons. It is designed to be elderly friendly and has features to monitor blood pressure, fall detection, Geo fencing and all other IoT features that goes to help a child monitor their elderly parents’s health remotely through an app. 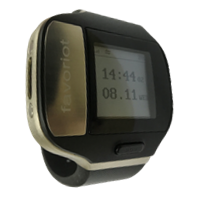 With the millions of working adults around the world with unattended elderly parents, FavorWatch represents a viable and affordable solution, and a first step into a brand new market space.